Fabrics made of pure fiber, especially of wool, silk, or linen, are very expensive because of the cost of production. Consumers have demanded less expensive materials than formerly, therefore the manufacturers have found it necessary to reduce the cost of production by some one of several ways. A certain amount or kind of adulteration does not always affect the wearing quality of the fabric, but advantage has sometimes been taken of the buyer by the failure of the manufacturer to label the products honestly. Oftentimes, however, inferior stuffs are sold under the name and at the price of those of pure fiber. 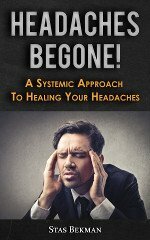 Consumers should become alert to the breaking down of this system of deception. They must learn the characteristics of the fibers, the method of adulteration, and ways and means of detecting the same. The constant improvements in the processes of manufacturing make it difficult, even for the expert, to determine whether materials are what is claimed for them. Consumers should learn to know the difference between staple fibers and cloths, both in appearance and the sensation produced by rubbing between the finger-tips. Staple cloths are those whose names, characteristics, and wearing qualities are generally known. 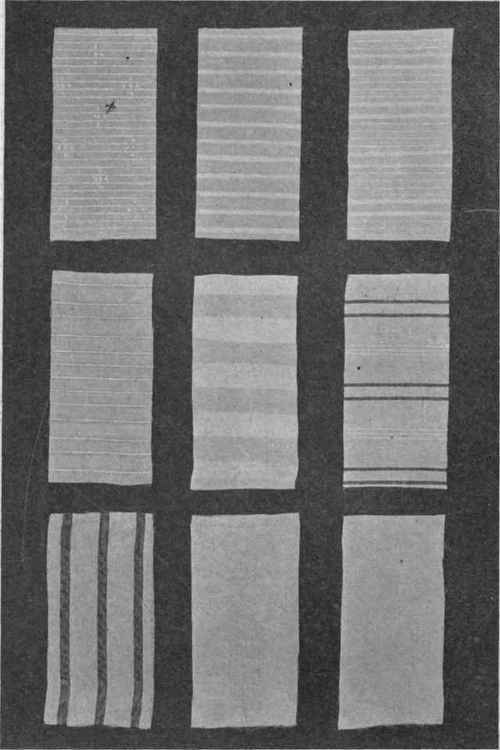 To be able to recognize one well-known cloth, made from each of the four principal fibers, will greatly aid one in classification of other fabrics. Cotton cloth is adulterated by the use of starch or clay, which fills up the spaces between threads, making cloth appear closer and firmer than it really is; this adulteration also adds weight, which aids in the deception. A certain amount of sizing is necessary to make the cloth firm for commercial handling, but a greater quantity than is necessary is frequently used. To detect sizing: In very thin materials, hold up to the light to see the starch; in heavier materials, brisk rubbing between the hands, will remove it, showing up the loosely woven threads. With some kinds of sizing, it will be necessary to wash or boil the fabric, to remove it. Linen is sometimes adulterated in the same way. Linen is also adulterated sometimes by adding cotton fibers to the linen, or by an entire substitution of cotton for linen fibres, the lustrous effect of linen being produced on the cotton cloth by means of calendering or being passed between hot rollers. The safest test for a mixture of cotton and linen fiber is the use of the microscope for testing the fibre, but microscopes are expensive. A simple test for the entire substitution of cotton for linen is to place a drop of olive oil upon the fabric; the oil makes the linen material more transparent than cotton. Another simple test is to break the threads; cotton breaks with a tufted, fuzzy end, linen with an uneven, pointed end. Wool is also adulterated by the addition of cotton; sometimes a spun cotton yarn and a spun woolen yarn may be mixed, or cotton yarn may be used in the warp when weaving woolen material. Again, a microscopical test of the fiber is the surest means of detection. Burning may be employed; ravel a bit of the cloth and burn a warp and a filling thread - a cotton thread burns quickly and with flame, wool chars slowly, without flame, and smells like burning hair. A woolen material which has cotton in it will become more wrinkled when wet than "all wool." Shoddy or made-over wool is also added to new wool to give an "all wool" fabric at a lower price; this is made of discarded woolen rags, made over into fiber and re-spun; this gives a shorter fiber than new wool, and when mixed with new wool can be detected by ravelling out a thread, when the short, broken fiber can be seen. Shoddy is sometimes woven alone into cloth, which, while comparatively good, is not so handsome and does not wear as well as new wool. Cotton is not always considered an adulterant when mixed with wool, as in the case of mohair and alpaca, which usually have a cotton warp - these are not sold for "all wool" and do not command an "all wool" price. Silk is sometimes woven with cotton, plain or mercerized, but cannot be spun with it. The burning test will apply here. Silk burns much like wool and leaves a small amount of crisp ash. Mercerized cotton is sometimes passed as silk under the name of pongee, tussah, or rajah. Silk is often adulterated by weighting or leading with metallic salts of tin or other metal which, when used in large quantities, soon causes the silk to cut. This is best detected by burning. The ash of weighted silk retains the original shape of thread or fabric and drops to pieces at a touch. Fig. 10. - Cotton fabrics suitable for wash dresses, skirts and shirt waists. 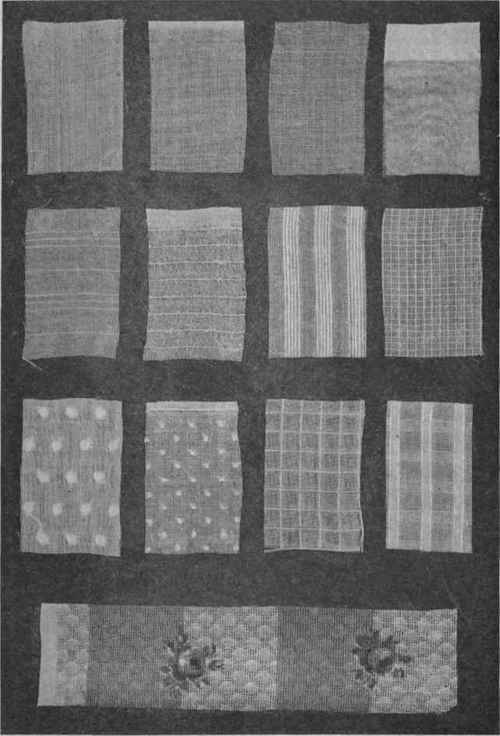 Upper row (left to right), gingham, domestic crepe and Japanese crepe. Second row (left to right) percale (striped), and corduroy. Lower row (left to right), heavy madras (2), and pique (1). Fig. 11. - Two upper rows, striped madras shirtings. 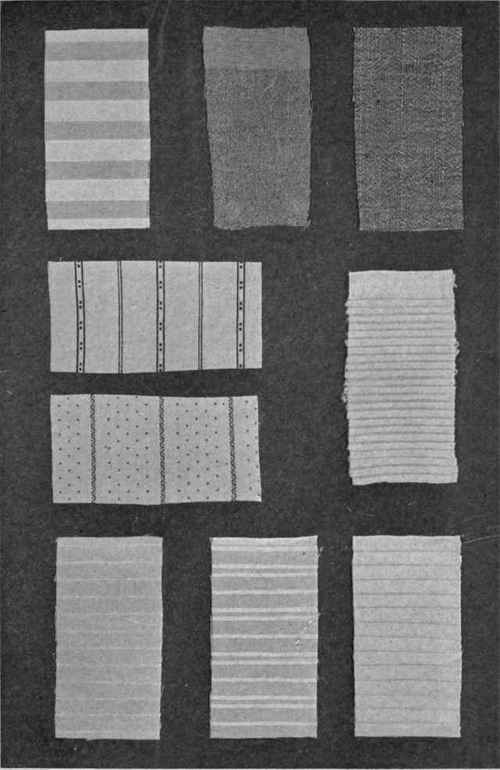 Lower row, striped and plain habutai silk, and silk broadcloth shirtings. Fig. 12. - Cotton fabrics suitable for lingerie blouses and dresses. Upper row (left to right), batiste (mercerized) Persian lawn, handkerchief linen, and voile. Second row, striped crepes (2), and striped and checked dimity. Third row, embroidered Swiss (2), and flaxon (2). Lower row, fancy flowered voile.